Little gifts are the nicest surprise, especially at Christmas. You can find a great gift sale in the new Aldi Catalogue. Board games, retro box set, Art Desk or activity backpack, Nivea men 3 piece gift pack, and more Christmas gifts are on sale at Aldi on Saturday. Kitchen appliances of the latest technology with a modern look and minimalistic design will make things in kitchen much easier. Find great products of Stirling to redesign your kitchen. 4 Slice toaster will cost only $59.99! Usually, these Christmas catalogue have gift sales that cover personal care packs or bags that can make nice gifts. It's a small kind of gift, however, the best of them are on sale in the catalogues. Festive food is a major category of the Aldi Special Buys Week 49. Visit pg 16-17 for these products. 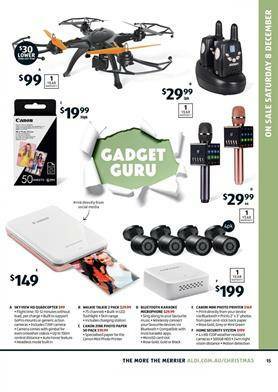 My favourite part of the catalogue is the page where you can find $30 cheaper Skyview HD quadcopter.